We’d love your help. 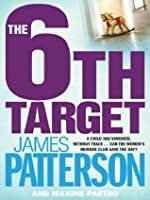 Let us know what’s wrong with this preview of The 6th Target by James Patterson. To ask other readers questions about The 6th Target, please sign up. I have decided I am a fan of this series. They are all so easy to read and always have sufficiently intriguing mysteries and a nice batch of friendly characters. Add to this short chapters which keep the pages turning , and you have books which are always good to have at hand for when you need something neither heavy nor demanding. The 6th Target is typical of the series. It has a couple of different police cases going on, one involving a mass murderer and the other child abduction. All four mem I have decided I am a fan of this series. They are all so easy to read and always have sufficiently intriguing mysteries and a nice batch of friendly characters. Add to this short chapters which keep the pages turning , and you have books which are always good to have at hand for when you need something neither heavy nor demanding. The 6th Target is typical of the series. It has a couple of different police cases going on, one involving a mass murderer and the other child abduction. All four members of the Women's Murder Club are involved to varying degrees although Lyndsey has the most significant role. Much of the story revolves around police work with its necessary failures and successes. Time is also spent in the court room and these chapters are written well. I have to keep reading these because I started them...but wow are they getting bad. The latest left it wide open for the 7th book. Also, my bf - a psychatrist took one look at the "Insane" killer and noted it wasn't even described correctly. also, I was left to wonder, if this person was doped up as strongly as he was...how was he still so clever? I am tried of Lindsey's whinning. I don't buy the friendships between the women, totally falls flat. More then anything, I don't see the appeal of Lind I have to keep reading these because I started them...but wow are they getting bad. The latest left it wide open for the 7th book. Also, my bf - a psychatrist took one look at the "Insane" killer and noted it wasn't even described correctly. also, I was left to wonder, if this person was doped up as strongly as he was...how was he still so clever? I am tried of Lindsey's whinning. I don't buy the friendships between the women, totally falls flat. More then anything, I don't see the appeal of Lindsey's hardly-seen boyfriend Joe...why is she pinning for him again? Beats me. Apparently beats her too since she keeps breaking up with him. Am I supposed to be rooting for them? Whoops, my bad. And again this book had 3 different plots...confusing and frustrating. Recommended to Rosie by: People who want a decent quick book to read. On a bright sunny morning a madman with a gun has made a trip on a ferry boat deadly for four innocent people, one of whom is a young boy. Lindsay Boxer's best friend, Claire and her son William were also caught up in the attack and Claire has been shot in the chest. While Claire fights for her life Lindsay and her new partner, Rich Conklin, pick up the case, and solving this one is personal. Then the shooter inexplicably turns himself in but he's says that he 'didn't mean to hurt anyone', and c On a bright sunny morning a madman with a gun has made a trip on a ferry boat deadly for four innocent people, one of whom is a young boy. Lindsay Boxer's best friend, Claire and her son William were also caught up in the attack and Claire has been shot in the chest. While Claire fights for her life Lindsay and her new partner, Rich Conklin, pick up the case, and solving this one is personal. Then the shooter inexplicably turns himself in but he's says that he 'didn't mean to hurt anyone', and claims that 'the voices in my head made me do it.' Now it's up to prosecutor Yuki Castellano to prove that not only is the man NOT legally insane, but that he's guilty of murdering four people, attempted murder of a fifth, and recklessly endangering the lives of everyone else on the farry. He has been deemed sane and capable of being tried in court and Yuki is determined to prove that he knew full well what he was doing, that he purposely took aim and starting shooting people, and that he should be found guilty and be punished to the full extent of the law in prison for murder, not in a psychiatric hospital. At the same time, parents all over the city are terrified when someone begins kidnapping young children and their nannies in full daylight. Then the case takes a terrifying turn when the kidnappers don't contact the families with a ransom demand. With very little to go on, Lindsay and Richie fight to find even the smallest thread of a lead, knowing that time is of the essence, and the clock is ticking. And, as if things weren't bad enough, people living in Cindy Thomas's apartment building are panic-stricken as someone is killing people at random and no one has any idea who would do such a thing to innocent people. This is the sixth novel in the Woman's Murder Club series and the books continue to thrill me with the suspenseful story lines while keeping me hooked as to the happenings of the four friends, Lindsay, Claire, Yuki, and Cindy. The 6th Target is an edge of your seat ride from beginning to end. The brilliant twists in the plot took me completely by surprise and I couldn't foresee what would happen next, only making the tension rise higher and higher. Maxine Paetro masterfully blends the three cases together while adding a few personal romantic sparks among the characters along the way. Even with everything happening it's easy to follow and even though it's the sixth in the series the story lines and crimes remain new and original, the characters are as fresh and interesting as ever. There seems to be endless excitement among the four friends, each one with individual twists that pop up unexpectedly, thus keeping me on the edge of the cliff in anticipation of what the next book, 7th Heaven, has in store. If you've been following my reviews of this series you'll know that this is the second time I've listened to these audio books. The first time was so long ago that I don't recall very much other than that I loved them and I'm enjoying them as much as I did the first around. I feel that there is too much going on in this book. It begins with a major shooting, where one of the women in this group gets shot. The trial of this murderer continues throughout the book, while other cases are happening, like some murders at an apartment building, and a kidnapping of little girl (who happens to be someone’s boss’ daughter). Everything is connected, making this a stressful time for the club, but they don’t seem concerned. Everything is treated lightly, never getting too deep I feel that there is too much going on in this book. It begins with a major shooting, where one of the women in this group gets shot. The trial of this murderer continues throughout the book, while other cases are happening, like some murders at an apartment building, and a kidnapping of little girl (who happens to be someone’s boss’ daughter). Everything is connected, making this a stressful time for the club, but they don’t seem concerned. Everything is treated lightly, never getting too deep into any one part. Patterson just skims these events. Makes me wonder if he wrote it or if Maxine Paetro wrote it. Is this series going to turn into a formula series, like Danielle Steel? Let’s just say that I am very disappointed, and if they continue the series in this manner, I will probably stop reading them. But, on the bright side, they created a T.V. show from these books that is pretty good! Lindsey (main character) is an idiot! Throughout this whole series I haven't been able to decide if I like her or not and I have finally decided that I don't. I think that is part of the reason it has taken me so long to complete the series. I am half way through this book and I have found myself actually skipping over whole chapters just finish the dang thing. Not like the chapters are long, any one who has read James Patterson before knows that his chapters are only about a page long (seriousl Lindsey (main character) is an idiot! Throughout this whole series I haven't been able to decide if I like her or not and I have finally decided that I don't. I think that is part of the reason it has taken me so long to complete the series. I am half way through this book and I have found myself actually skipping over whole chapters just finish the dang thing. Not like the chapters are long, any one who has read James Patterson before knows that his chapters are only about a page long (seriously). And even with skipping whole chapters I still know exaclty what is going on. This series isn't horrible, but I would only start if there is nothing else to read. I just noticed that there is a 7th book! Will it ever end? I just read another Women’s Murder Club so this is the second one in close order. The last one (4th of July) left me feeling a little iffy about this series – not really that good I thought. I wanted to try another one right away to see if I could just ditch this batch of books on my TBR shelf. The 6th Target rolls right out with a mass murder on a ferry by a crazy guy. Then, unexpectedly, the crazy guy turns himself in, making me wonder what we are going to do with the rest of the book. The last I just read another Women’s Murder Club so this is the second one in close order. The last one (4th of July) left me feeling a little iffy about this series – not really that good I thought. I wanted to try another one right away to see if I could just ditch this batch of books on my TBR shelf. The 6th Target rolls right out with a mass murder on a ferry by a crazy guy. Then, unexpectedly, the crazy guy turns himself in, making me wonder what we are going to do with the rest of the book. The last book turned into a slightly interesting but not exciting story of a trial and I thought this one was going to follow that same path. I was not thrilled. The role of the trial in this book is only slightly more interesting and thankfully shorter. The author seems determined to show that the tabloid realities of Rodney King and O.J. Simpson are not forgotten. But, let’s just see where this goes, OK? The chapters are notably short as in previous books and that in itself does keep things moving along relatively quickly. Several cases vie for attention: the crazy mass murderer, the child kidnapper and the apartment building noise vigilante all have their rambunctious moments of implausibility. And, of course, our heroine’s erstwhile romance. I am somewhat embarrassed to admit that I bought several books in the Women’s Murder Club series drawn in by the promised but ultimately disappointing “Women’s” connection. I have now read several and must consign the several remaining to the free library give away rack at the restaurant across the street. I gave my first encounter four stars a couple of years ago, a reprise three stats last week and this most recent offering two stars for its worn and predictable path. Time to make room on my groaning bookshelf for some more noteworthy offerings. Farewell, James Patterson. RIP, Maxine Paetro. I have been ever so gullible and desperate for diversion. But I must raise my sights. I'm going to keep going with these because I'm addicted to the terribleness, and because I develop low-grade anxiety when I don't finish stories/series. Lindsay is a whiny, unprofessional baby. Listening to her complain about being Lieutenant and asking to drop back down to her previous rank of Sergeant (I mean, just keep playing into that sexist idea that this job is too hard for I'm going to keep going with these because I'm addicted to the terribleness, and because I develop low-grade anxiety when I don't finish stories/series. Lindsay is a whiny, unprofessional baby. Listening to her complain about being Lieutenant and asking to drop back down to her previous rank of Sergeant (I mean, just keep playing into that sexist idea that this job is too hard for the little ladies why don't you? ), while running around trying to solve a slew of different plot lines (3 in this one) that keep intersecting and confusing the story, is exhausting and frustrating. The plot here is cheap, taking easy twists that don't make sense within what we've been previously asked to believe as the reader. The mental illness discussed doesn't read like it was researched very well at all, and it wasn't handled in a way that created a menacing villain but a laughable one. If my husband and I ever spoke to each other that way, I would smack the both of us. But him first. The friendship/teamwork of the Women's Murder Club has become this male-created stereotype, kind of like what bad jokes about women sound like. I find it all at once fascinating that someone can write these scenes and think, "yes, this is good. I'd like other humans to read this with their eyeballs"; and also offensive that someone can write these scenes and think, "yes, this is how real human women would speak and behave with one another." This book has started the beginning of my actual physical loathing towards these women. I've decided I don't want any of them to succeed in their lives or endeavors. I want them all to experience soul-crushing pain so maybe they will stop hugging so much and being just sooooo supportive of each other. Half of the time, I felt like I was reading a novel written as if Alex Cross was on Saved by the Bell. This series is literally the after-school special of crime novels. In this sixth installment of the Women's Murder Club series, Lindsay is faced with bringing three different perpetrators to justice in unrelated cases. The first is killing tenants (and their dogs) in his apartment building when they make too much noise. The second is kidnapping particularly gifted and attractive children, and the third is a cunning assailant who is also seemingly legally insane. I can't provide any further details without spoiling the suspense for those who haven't read the boo In this sixth installment of the Women's Murder Club series, Lindsay is faced with bringing three different perpetrators to justice in unrelated cases. The first is killing tenants (and their dogs) in his apartment building when they make too much noise. The second is kidnapping particularly gifted and attractive children, and the third is a cunning assailant who is also seemingly legally insane. I can't provide any further details without spoiling the suspense for those who haven't read the book yet. In addition, Claire has a surprise announcement and Lindsay breaks up with Joe, her longtime FBI beau. But is the breakup permanent? I liked these books before. I am getting back into the series. Lindsay Boxer works for the San Fransisco police department and she is now a Sargeant. With her friends Yuki and Claire, they solve crimes. They call themselves the Women's Murder Club. The newest case is a shooting on the Del Norte ferry. The convicted is Fred Brinkley. He shot six people because the voices in his head told him so. Will pleading insanity be in his favor? One of the people shot was Claire and her son, Willie. Still a good quick book to read and Lindsay is still a tough girl with a great heart. I just can't get into this one. This was definitely better than the ones I had previously read. There was a lot going on, but each was concluded in a realistic way. Book 6 in the series "A Women's Murder Club"
I am totally addicted to this series, all the books are simply fun and entertaining and this one is no exception. In the 6th target we find more than just a page turner with a great plot and many surprises, a real doze of adrenaline for the readers. While we are engrossed in this mystery we get to know a little more about the members of this unusual Club and find ourselves immersed into their different life choices. This one begins on a ferry boat, when Book 6 in the series "A Women's Murder Club"
This one begins on a ferry boat, when six shots are fired killing four passengers and injuring one of the Club's members. Claire Washburn is now struggling for her life while the others fight to keep a madman behind bars before anyone else is hurt. If you like courtroom scenes the story has the typical exchanges between lawyers, witnesses and the accused. Yuki Castellano presents her first murder case with pizazz. Meanwhile, San Francisco is plagued with a rash of other bizarre crimes. Children with their nannies are being plucked off the streets seemingly without any motive and Cindy Thomas finds her apartment building under siege by vandals. Amid the rising panic and the excitement, Police Lieutenant Lindsay Boxer juggles her personal life with the investigations. 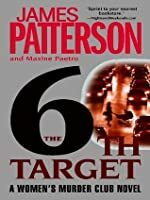 The gang is back to solve another case, except that this time, there are numerous parallel mysteries running amok in Patterson's THE 6TH TARGET. Fred Brinkley, a man who hears voices inside his head, is videotaped murdering four innocent people aboard a ferry. He's charged with attempting to kill two others, one of whom happens to be a now critically injured Claire Washburn. 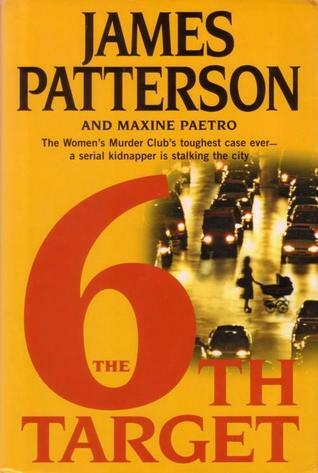 A five-year-old piano playing prodigy by the name of Madison Tyler is snatched off the street along with her nanny, and wi The gang is back to solve another case, except that this time, there are numerous parallel mysteries running amok in Patterson's THE 6TH TARGET. A five-year-old piano playing prodigy by the name of Madison Tyler is snatched off the street along with her nanny, and with no ransom note coming in to the family, things aren't looking good. At Blakely Arms, an apartment complex, things are going from bad to worse as a dog is viciously murdered, residents are attacked, and people are beginning to suspect a neighbor in the building. I am loving the Women's Murder Club books, they are easy to read, short chapters, lots of action. The 6th target sees Claire shot & nearly killed, child abductions & killer stalking the halls of the block of apartments he lives in! In typical Patterson style, the plots intertwine well, without getting lost & confusing, and the action is 100 mph. I've read lots of reviews that slate this book & the series, some saying that the characters have gone of tangent & it no longer feels I am loving the Women's Murder Club books, they are easy to read, short chapters, lots of action. I've read lots of reviews that slate this book & the series, some saying that the characters have gone of tangent & it no longer feels like a women's club as they seem to have stopped solving the crimes together, and that there are too many plots instead of just one main story line. Each to their own opinion, but I disagree! A madman loose on a ferry, with a gun, kills 4 people and injures one of the ladies of the Women's Murder Club. Then he runs. Yuki Castellano, our newest member of the club and brilliant lawyer, has decided to switch sides for a while. Though she is second chair to the ADA prosecuting this case, he has a heart attack and Yuki has no choice but to take the podium and continue on. The public defender insists that his client was insane at the time. But was he really? Or is he just a good faker? Mean A madman loose on a ferry, with a gun, kills 4 people and injures one of the ladies of the Women's Murder Club. Then he runs. Yuki Castellano, our newest member of the club and brilliant lawyer, has decided to switch sides for a while. Though she is second chair to the ADA prosecuting this case, he has a heart attack and Yuki has no choice but to take the podium and continue on. The public defender insists that his client was insane at the time. But was he really? Or is he just a good faker? Meanwhile, Cindy has moved into a new apartment building and people are getting hurt and dying. Another madman is on the loose. These women can not catch a break. This one was good but I found parts to be confusing, with 3 different cases going on at the same time it seemed to jump around more than the previous ones in this series. It was still great. I don't know what Lindsay is thinking not telling Joe yes. shes nuts! I feel like this book should've been one case more detailed instead of 3 cases with less detail. Another good book in this series. I love Patterson's mysteries so much. A bit of a mish-mash of crimes occur that Lindsay Boxer and her SFPD detectives have to solve. There’s the ferry shooting by a so-called legally insane man and his consequent trial; there’s the kidnapping of a five-year old little girl, and then someone seem to be murdering neighbors in Cindy’s new building. Most notably for this one is that Lindsay is back to being a Sergeant, relegating her Lieutenant post to Warren Jacobi, her old partner. Lindsay asked to be back in the field, so she should A bit of a mish-mash of crimes occur that Lindsay Boxer and her SFPD detectives have to solve. There’s the ferry shooting by a so-called legally insane man and his consequent trial; there’s the kidnapping of a five-year old little girl, and then someone seem to be murdering neighbors in Cindy’s new building. Most notably for this one is that Lindsay is back to being a Sergeant, relegating her Lieutenant post to Warren Jacobi, her old partner. Lindsay asked to be back in the field, so she should be happy, but she's doubting her decision, and then when she starts to question her long-distance relationship with Joe, she decides to break up with him, hating saying goodbye every time after his short visits. On top of that, Claire Washburn, the ME, was one of the ferry victims – luckily not fatal. This review has been hidden because it contains spoilers. To view it, click here. I am biased. I love the women's murder club book: and characters that belong to it. But, to me, this book was well below the standard of the others I have read. I stopped one third of the way through. This book was just so so for me. It had me asking myself if I really wanted to spend anymore of my reading time with these ladies. Then I got to the ending and the answer was "hell yes!" See you soon book 7! First of all I have to admit that I honestly only read this book because I didn't prepare for my library's renovation and I didn't have anything around that was new. The entire time I was reading this book, I felt like I was waiting for it to end. Now I just wish I had re-read one of the books I own. I though it would be interesting because I'm normally a huge fan of James Patterson's books, but this one seemed to drag on forever. Maybe it had something to do with the fact that I read this one First of all I have to admit that I honestly only read this book because I didn't prepare for my library's renovation and I didn't have anything around that was new. The entire time I was reading this book, I felt like I was waiting for it to end. Now I just wish I had re-read one of the books I own. I though it would be interesting because I'm normally a huge fan of James Patterson's books, but this one seemed to drag on forever. Maybe it had something to do with the fact that I read this one without reading the prequels. The plot sounded like something that I would like but when reading the book I felt that there were too many plot lines. While some authors can write with several story lines and keep the book clear, this wasn't the case. It seemed to jump from one case to another and then back. At one point I had to go back and re-read a chapter because I missed out on some details without realizing it (although this may speak more on how well I can pay attention than on the book itself). What I disliked most about this book was the characters. They all seemed so fragile, and not in the way that all humans are fragile in a sense, but more that they were broken down by the most trivial things. I sighed a lot at some of their (over)reactions. Η υπόθεση των εξαφανισμένων παιδιών και τον νεκρών νταντάδων τους με κράτησε σε αρκετή αγωνία και προκάλεσε την οργή μου όταν έμαθα τι πραγματικά κρυβόταν πίσω από αυτήν την πλεκτάνη. Η αφορμή για να στηθεί αυτή η «επιχείρηση» έδειξε το άκρον άωτον της κτηνωδίας που μπορεί να κρύβει ο άνθρωπος μέσα του. Μια καλά στημένη κομπίνα που απάγει αθώα παιδιά, προκαλώντας αβάσταχτη οδύνη στις ζωές των γονιών τους και ανατρέποντας για πάντα την καθημερινότητά τους. Σε αυτό το βιβλίο, η επιθυμία της Λίνζι Μπόξερ γίνεται δεκτή: υποβιβάζεται σε αρχιφύλακα, ώστε να αφιερώνεται περισσότερο σε αυτό που πραγματικά ξέρει να κάνει και αγαπά: να βρίσκεται στον δρόμο, να είναι μέρος της ενεργού δράσης, μακριά από γραφεία και καθιστική εργασία. Η Λέσχη συγκεντρώνεται κάνα δυο φορές, πιο πολύ όμως για νέα, κουτσομπολιά και ειδήσεις παρά για τις τρέχουσες υποθέσεις. Τέλος, κάποιες απερίσκεπτες κινήσεις της Λίνζι βοηθούν τον Τζο να καταλάβει πόσο κακό κάνει στη γυναίκα που αγαπάει με την απόσταση που τους χωρίζει κι έτσι προβαίνει σε κάποιες αλλαγές. Τέλος, πραγματικά αναρωτιέμαι πώς έχουν επιζήσει ως τώρα όλοι οι χαρακτήρες, αφού τρώνε συνέχεια: ντόνατς, cinnamon rolls, πίτσες, σάντουιτς, κοτόπουλο με κάρι, ρύζι. Είπαμε, δεν υπάρχει μεσογειακή διατροφή στις Πολιτείες αλλά όλοι τρώνε τα ίδια και με άτακτα ωράρια; Αναρωτιέμαι!